Eight indigenous activists were killed in a grenade attack on a meeting in Dagua, in the department of Valle del Cauca, on Thursday 21 March. At least four others were injured. Among the victims were members of the ethnic groups Embera, Waunan and Nasa. The assailant has not been caught. The meeting was being held to discuss regional strategies for participation in the ongoing Minga strike which began in the department of Cauca and has since spread elsewhere. On 10 March, indigenous and rural communities in Cauca began protesting dire conditions in the region, where underdevelopment, political violence and poverty are rife. Protesters accuse the government of failing to provide the investment agreed to resolve previous regional strikes. Other demands include full implementation of the 2016 peace agreement and increased security for social leaders in the region. Since the start of 2016, at least 125 social leaders and human rights defenders have been murdered in Cauca, making it the most dangerous region in Colombia for these activities. In a statement responding to the attack, the Regional Indigenous Council of Cauca said ‘the National Government is required to attend and investigate these terrible events that occurred in the midst of the mobilisation and abide by standards of the international framework of human rights, to guarantee the exercise of the fundamental right to peaceful protest contained in our Political Constitution and in international treaties and instruments of human rights that protect the rights of indigenous peoples. The strike has seen protesters blockade the Pan-American highway which runs through Cauca, thereby closing one of the main land routes into Ecuador. Video footage has shown multiple attacks by ESMAD riot police on protesters, including children, women and the elderly. Protesters said that on 19 March at least three people were injured by security forces, which have also been accused of entering indigenous communities to attack protesters. 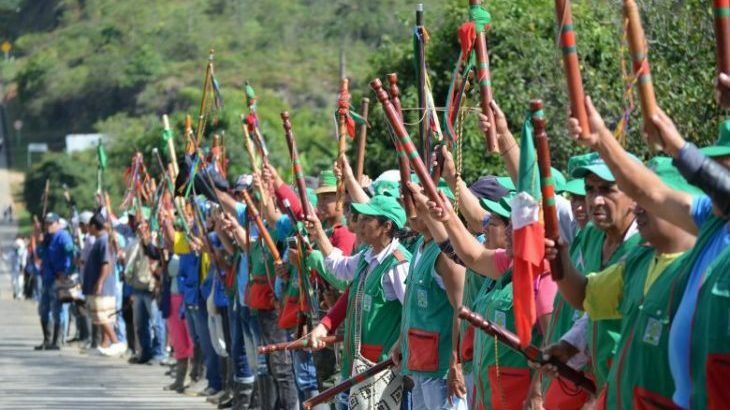 Indigenous authorities prohibit the carrying of arms in their communities, with the exception of the staffs carried by members of the Indigenous Guard. The injured were identified as Manuel Mosquera, Weimar Lame and an unnamed medical worker. Following the shooting death of a police officer who was engaging protesters at the blockade on the Pan-American Highway, President Iván Duque said the protests had been infiltrated by illegal armed groups. Little evidence appears to support this claim, with regional indigenous and human rights groups accusing Duque of attempting to criminalise legitimate protests. Reports said that ESMAD had injured at least 40 protesters by Friday 22 March. In its latest human rights report on Colombia, published two weeks ago, the United Nations emphasised the Colombian government’s obligation to respect peaceful protest as a legitimate democratic right. Since his inauguration in August 2018, Duque has attempted to clamp down on public protest, a move in violation of constitutional principle. Minga strike leaders are calling on Duque to visit Cauca to negotiate their list of demands. His government has said that it lacks the financial resources to implement agreements made with the previous administration. Currently, the strike appears far from resolution.